The Kim group is a diverse group of students, postdocs, and research staff with a strong interest in spectroscopic studies of protein dynamics. 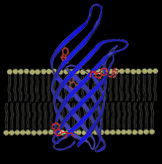 Current projects include investigations of membrane protein folding, membrane disruption by antimicrobial peptides, and structure and dynamics of radical intermediates. We utilize a host of powerful optical tools, including UV resonance Raman spectroscopy, transient absorption/emission spectroscopy, and microscopy. We welcome inquiries and visitors! Kim group meetings: Thursdays 5 p.m. in Urey Hall 3221. All are invited! Email for our schedule.